View Poll Results: Is a SHO wagon tow vehicle worthwhile? Just tossing this up here to see what the consensus is on the SHF. After racing the last 2 full seasons, and towing many miles, I've been searching for the optimal tow setup for being at the races. Currently I use a 96 grand cherokee 4L auto with quadratrac, and an open aluminum trailer. It does ok, decent comfort, at 16-17MPG average while towing. Not bad. at one point someone mentioned station wagons....lower profile for aerodynamics, large cargo area, possibly could make sleeping arrangements inside(my jeep was just too short for me to sleep comfortably in). Then my friend said the Ford Taurus Wagon...and then we could swap in the SHO V6 from the SHO Taurus Sedan, that came with a 5 Speed manual trans. The SHO motor had variable length intake manifold and heads designed by Yamaha, which is also the brand bike I race for added cool factor. 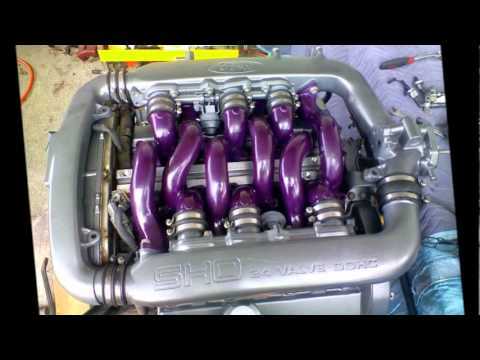 3.0L V6 making 220HP and 200ftlb. The SHO swap into a wagon has been done many times and is fairly straightforward. So what do you think? Is it super cool and should be done? Or is it a waste of time and would rip apart under stresses of towing? I've seen bolt on tow hitch with 300lb verticle 3500lb tow rating, which is much more than the trailer I use. It could work, and if it works for you that's what matters. If you have it in your budget a newish Chevy silverado with a 5.3l V8 and the 6 speed auto trans does VERY well fuel mileage wise, and has a 10,000lb tow rating. My buddie has one and he sees better empty mileage than I do with my 3.5l I5 colorado. I get about 19 and he gets 20+ depending on how many highway miles on it. Pulling our 6000lb enclosed race trailer (8x28') it gets about 12-14 depending on traffic, and pulls it without hesitation. If you can afford to I always recommend buying more truck than you need because once you have enough vehicle to tow what you have you will end up loading it down more or getting a bigger trailer happens to us all the time. If you have the budget for a late model 7.3L turbo diesel Ford though go for it, as they are bullet proof as well. As a former Taurus owner I'm all for it. Definitely. Since I sold the car years ago I've not been on TCCA much so it would be cool to follow a Taurus build again. insulinboy - unfortunately budget is my #1 limiting factor, of which there is practically none.. I'd love to get a turbo diesel sprinter and call it a day....Cummins trucks I like, and the 7.3 I'm a fan of also, just way out my price reach. I have a 96 F250 at my disposal, which has the 5.8L I think, and maybe gets 12-15MPG empty, worse towing...not gonna work for multiple trips to GA and OH. I'm avoiding a single specialty vehicle like a cargo van, box truck, schoolbus, ect. Something like that would only be used for racing weekends, and the rest of the time would get little use for the tags/insurance/extra maintenance costs. They aren't practical for anything but hauling. Poor MPG. Not worth it for my purposes. In 10 minutes on Craigslist, I've found multiple Taurus Wagons with under 100k old lady miles, for $500. Blown motors or trans is ok since I'll swap in the SHO motor and 5 speed.....then I found a 1994 SHO for $1000 best offer, a shop did work to it then the owner never paid, they want to sell it without title rather than do the mechanics lien paperwork. Looks like it could be a <$2000 swap if I'm patient and find the right donor vehicles. Another month and 1994 models will be historic in MD, so no inspection or emissions.....it's looking better and better. As a former SHO owner, I say do it. Just watch out when you run too much nitrous on it, one of the intake runners has issues with puddling and it makes a big bang... Lol. haha no NOS for me...I'd be into doing a turbo for sure. It would probably hold up to low 5-7 psi boost for a while. Another very tempting option would have to be an LT1 Roadmaster wagon. Actually I looked those numbers up and incredibly the Taurus Wagon has just slightly wider and longer wheelbase. The Jeep is 58 wide, the wagon 61.6" front 59.9" rear. Wheelbase 0.1" longer on the wagon. 205/65/15 vs 215/75/15 tire sizes so very similar. Hmmmm I have to look into that more. Rear Wheel drive would be a big bonus, I really don't like FWD. The Roadmaster was offered with a factory tow package too. Don't see a manual trans option but for a tow rig an automatic is convenient at times when on the long haul. I use a 2005 Chevy Uplander minivan these days. It works great, plus it has Chevrolet power. I would think you would be let down by the blue oval. But otherwise it's not a bad idea. ^ Just messing with you! I had an old Dodge for motocross and enduros and windsurfing. It rocked. Great camper. Everything else comes in second but the first second is an enclosed trailer. Light, single axle. Ever watch On Any Sunday? They used a van. I'm not so sure I could be happy with a minivan in the off season though haha. A 5speed SHO wagon at least has SOME cool factor to it, the SHO bumper and front end could help the styling some. No I haven't seen that. That's one downfall of the open trailer, you can't leave it alone for long without worrying about things walking off. Usually not a problem as I mostly just drive right to the track, no overnight hotels or anything I'd have to worry about. A van would loose for me on the fuel economy side. I think I'd have a hard time finding a work/cargo van that could beat the 17mpg my Jeep did. Maybe a 4cyl mini van would get something in the mid 20's MPG. I've seen plenty of decked out vans including a little window AC unit in a custom rear door panel. One allure to the van is you can have everything inside at once, without a trailer...although that could cause it's own issues if you spill gas or something in your sleeping area. I use a Honda element. Its AWD, gets about 22-25 mpg with or without the trailer, and tows my bike(s) on the trailer like there is nothing there. I have an 04 with 150 K and it is dead nuts reliable, and I will buy another one in a year or so and give this one to my son. All the seats fold flat or come out so it is like a mini camper. Moral of the story? Almost any car has enough power to tow a motorcycle, you needn't even ask. (340HP) or better yet the SRT-8 (425 HP) Stealthy looks, especially in black with lots of tint and most important for a tow vehicle, a V8. While a build of the two vehicle would be fun, spend your time and money on the bikes. Yea I think a 4cyl could do it, but would be a workout with the amount of stuff I usually pack. Maybe I could go minimal on my packing and make it work out. Yea the SHO wagon was a neat idea, but more work than it's worth in the long run probably. A Magnum or R/T/SRT-8 would all be cool, but unfortunately several multiples out of my price range for my personal tow vehicle. If I sell some bikes before spring I might look for the Roadmaster, I've seen several with low miles for around $1500...just gotta find one with the factory tow package that grandma used for groceries once a week. You can always push aside your spares and crash in the back of a wagon. That is the allure of the wagon. The Jeep was just too small to sleep in comfortably. I'm over sleeping in a tent, or on my cot in the open. I want something I can put a small AC unit in for summer comfort sleeping. The more I race the more I realized the most important thing of a race weekend full of traveling is getting a good sleep. So Shayne I was wondering if you ever decided on a tow vehicle? 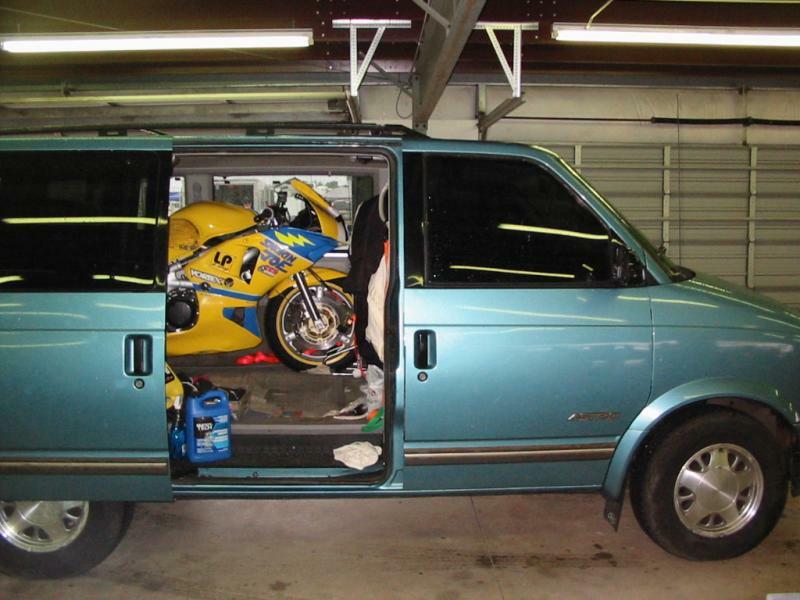 I have raced 14 years using a chevy astro. It is IMHO by far the ideal vehicle. 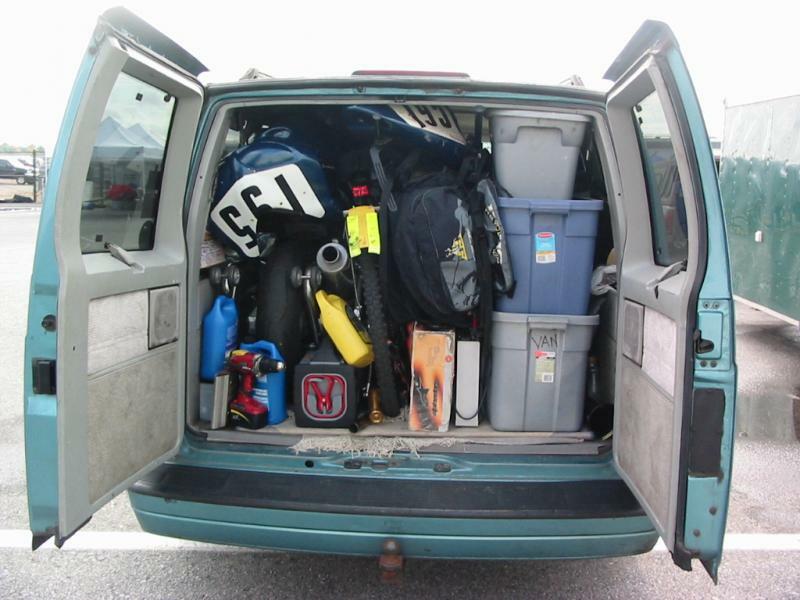 It can haul 2 racebikes (which I load by myself) and all the gear. Then you unload it and can sleep in it (2 people). It has a 4.3L v6 that gets over 22 mpg. Like was said, you can park and lock it, bikes are protected from elements. It is also my only vehicle so I can put the 2 rows of seats in and carry 7 people. It has WAY more interior room than a suburban or any SUV. Also super reliable. I do all my own wrenching and they are known to go 300k mi even used as a delivery van. And the best part is that I paid $2200 cash like 6yrs ago. Best bang for the buck too. Last edited by smokinjoe73; 07-12-2014 at 12:33 PM. Actually I did. Stumbled upon a deal from a friend of a friend who had a 1994 Toyota Pickup short cab/bed 2wd 5 speed for $2000. 122k miles, Freshly rebuilt trans, timing chain/guides/gears/oil and water pumps just replaced. Came with a cap. I love the 22RE motor, I've had two over 300k running great. Got it about a month ago, I put my race bike in the bed and did a track day, it did great through some WV mountains. The tow bumper hitch is too rusty to be used, so i'll be making a tow hitch receiver. Then I'll tow my aluminum trailer with two bikes to VIR next month for a good test. My current plan is to buy a 2000ish Toyota Tundra later this year to have something 4wd and be able to tow my 1975 17' coachman Cadet camper. Speaking of Astro's...and campers....check out this huge Astro Camper I saw on CL! You could fit at least 4 bikes in there! Last edited by 98VTRrider; 07-21-2014 at 06:49 AM. That is one awesome astro! You can easily camp in a regular astro too. I made screens for the front window sliding door and rear doors. Nice! My girlfriend and I kept her dad's '98 Tacoma after he passed and I'm pretty sure we'll keep it forever. Can't beat those older Toyota pickups (or just about anything Toyota made in the 90's). I'm at 186k miles on my Avalon and it still runs like a new car. Plus you could drive that thing for the next five years and as long as you take care of it probably sell it for more than you paid for it. The LT1 Roadmaster is so queen family truckster. I love the idea. Really a van is the best option. Everything is inside, including you, secure, dry. I had an '81 GMC short wheel base (heavy half). Lots of room inside. Wish I still had it. Owned two Astro vans, and while the power trains are very solid the rest of the vehicle leaves something to be desired after they get some years on them (please don't beat me up evil man of nothing). Too bad Toyota doesn't make a full size van based on the last generation of Tundra. Wow, parallel universe. I had both those trucks. Same order, same decade, same reason. Need some trackday tow vehicle ideas..
Quick Reply: Ford Taurus SHO Wagon - For race bike tow vehicle?